Having a legacy that dates back centuries, kamado grills are notorious for their egg-like shape and how they hold very high/low temperatures. 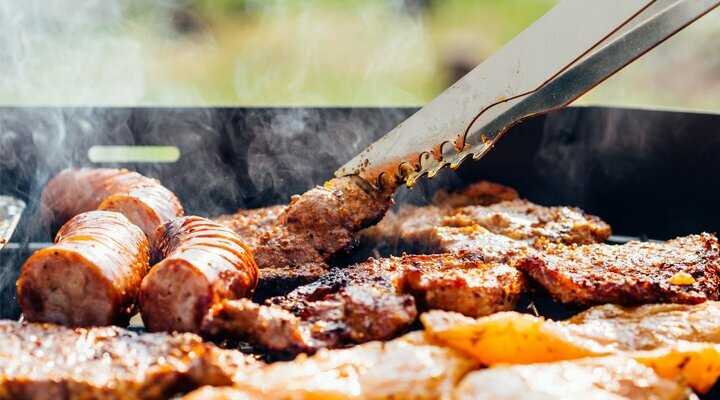 The following article reviews the good and bad of ten top-selling products in order to find the best kamado grill of 2018. Criteria include insulation, cooking space, and extra useful features. The grills are grouped according to their material, ceramic or steel. The Primo Oval XL is the best kamado grill with extra storage space. It has two steel side tables along with a cart underneath. The cart may rust though. For cooking, it has an initial large cooking area with the option to add another rack. Its design offers a variety of cooking methods. However, many accessories have to be purchased separately. From Kamado Joe comes their Classic II design that features a multi-level cooking system. Their patented top vent maintains precise airflow, while the wire-mesh fiberglass gasket provides an airtight seal. Though it’s heavy, it’s easy to assemble, and made from quality, long-lasting material that’s designed to be weather-resistant. Concerning the stand, however, the upper half doesn’t appear to be properly secured to the lower; it can potentially be knocked down. Even so, this is the best kamado grill that delivers consistent heating, is long-lasting, and user-friendly. This Louisiana Grills Kamado features an easy to use top tamper that grants you control of the airflow. However, sometimes the lower vent may not seal correctly and let in more air. When it comes to cooking, it has dual grates to give more space. The lid is easy to lift and hold in place, and the side shelves can fold down and out of the way when you need to store the grill. Visions Grills Pro Kamado may be remarkably heavy, but it is built to last. It has good heat retention and can reach high heats fast. For low and slow cooking, however, you may need to check on it more frequently as it’s difficult to maintain lower temperatures. Additional useful features found on this grill include an ash drawer for easy cleanup, dropdown side shelves, and locking caster wheels. The thick ceramic walls in this kamado grill provide even circulation throughout thanks to its dual-action top vent. It can maintain its temperature whether you’re cooking high or smoking low for hours. Although the exterior paint may crack, many still view the Duluth Forge as the best kamado grill due to how well it can hold heat no matter what you’re cooking. With the heavy ceramic body on the Pit Boss Kamado, it utilizes less charcoal so you can save on fuel consumption. The cast iron tamper is easy to use so you can control the flow of air. Cooking is versatile as well as it comes with two-tiered grates. They’re hinged as well so you can add charcoal without removing the food. For extra features, there’s the built-in thermometer and the folding side shelves. Some of the quality on the shelves (e.g. mounting hardware) isn’t as durable as the rest of the grill though. The Broil King Keg may be the best kamado grill for tailgating. The two side shelves are not only removable, but its wheeled base is trailer hitch adaptable so you can take it anywhere. It has a durable design to withstand travel, and it’s lighter in weight than other kamado grills for better mobility. Though the insulated steel design offers great and fast heating, it can be tough to lower temperatures. Look at our best charcoal grills reviews for more information. Maintaining and controlling temperatures is easy with the Char-Griller Akorn Kamado. This is due largely to its triple-wall construction and adjustable top damper. For quick cleanup, it features an ash pan. More beneficial features include folding side shelves with utensil hooks and a removable warming rack. Although it has a cart with wheels, the design doesn’t seem as high in quality as the rest of the grill. Besides being a kamado grill, this can also be used as a smoker, you can check here more smoker grills that we recommend. The Char-Broil Kamander Grill is designed user-friendly. There’s a removable internal ash pan for mess-free cleanup, a removable drip pan, a wire bottom shelf for storage, and a foldable side shelf for additional storage or prep space. Its insulated, double-wall steel construction heats up the grill quickly and maintains its temperature well. However, you may have to supervise often so it doesn’t overcook food. Finally, the best kamado grill on our list is the Akorn Jr., this grill is lighter than most kamado-style grills and can still provide even, rapid heating while using up less fuel. Controlling temperatures is simple as well. The cleanup process is smooth thanks to the easy dump ash pan. It features a sturdy steel design to hold up over time. Even so, it can have quality control issues. Even if kamado grills all utilize the same egg-like style, there are many differences that allow them to stand out which can make it difficult to determine which one is truly the best kamado grill. Out of the items in our list, which one do you feel it stands out from the rest, or maybe you have others in mind that we didn’t review? Feel free to share your thoughts in the comments.